There was a saying at the Speedway in the 1970s that new cars never won the 500, even if they were quickest. 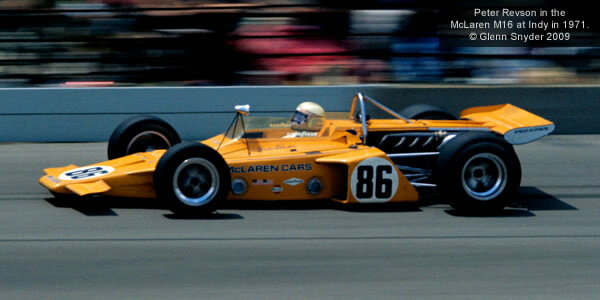 So it proved in 1971 when the new McLaren M16 was by far the fastest car at the Indy 500, taking three of the top four places in qualifying, but it was Al Unser in his Lola-derived, George Bignotti-modified PJ Colt that won the race. The Colts took Unser to victory in the five of the first six races of the season, the other falling to Mike Mosley in AJ Watson's heavily modified 1968 Eagle. Thereafter races fell to AJ Foyt's latest Coyote evolution, to the similarly evolved Eagle 71 of Bobby Unser and only at the end of the season did Marc Donohue take two wins in the M16. The other race was won by Al Unser's teammate, Joe Leonard, in a race of attrition at Ontario in September when none of the top ten qualifiers finished the race. With the USAC points system rewarding reliability, Leonard shot into the championship lead from Al Unser, whose car had led the race for 84 laps before retiring. Al Unser failed to finish either of the remaining races and Leonard was crowned champion. It is worth noting that Bobby Unser's Eagle took seven pole positions from the twelve races and McLaren M16s took another three. The race was not to the swift.